Seventeen million people will qualify for tax credits to reduce the cost of health insurance under Obamacare, according to a report released Tuesday. That amounts to about 60 percent of the 29 million people who could make up the market for the health insurance exchanges created by President Barack Obama's health care reform law, the Henry J. Kaiser Family foundation estimates. Enrollment via the insurance exchanges began Oct. 1, but has been hampered by the failed launch of HealthCare.gov, the federal portal to the marketplaces in more than 30 states, and technical problems affecting several of the state-run exchanges. 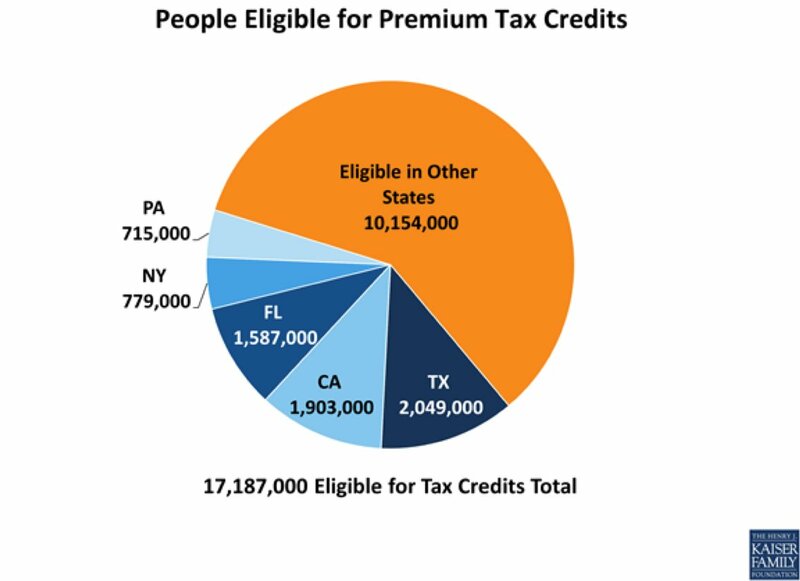 Residents of five states -- Texas, California, Florida, New York and Pennsylvania -- represent more than 40 percent of the people who would qualify for tax credits across the country, according to the Kaiser Family Foundation. California and New York are operating their own insurance exchanges, while the other states are part of the federal system. The report includes breakdowns of how many people are eligible for tax credits in every state. The insurance exchanges are intended for people who are uninsured or who buy insurance on their own because they don't get health benefits from their employers. Those already covered by job-based health coverage or government programs like Medicare and Medicaid don't need to use the exchanges. The Affordable Care Act provides two kinds of financial assistance based on income. People who earn up to 400 percent of the federal poverty level, or about $46,000 for a single person, are eligible for tax credits to reduce the cost of their monthly insurance premiums. In addition, people who earn up to 250 percent of the poverty level, or about $29,000, can get additional subsidies to cut out-of-pocket costs like deductibles and copayments. Subsidies mainly will go to younger, working people, according to an analysis published by Families USA in April. The value of these subsidies will differ based on the price of health insurance, which varies greatly by state and by factors such as age. Although millions of people will get tax credits large enough to cover the full cost of their insurance, others will get smaller subsidies, and people earning above 400 percent of the poverty level will have to pay full price. In some cases, those premiums will be higher than prices available on the current health insurance market. Although the Kaiser Family Foundation projects close to 30 million people could be using the exchanges, actual enrollment during the first year is expected to be much lower. The Congressional Budget Office projects that 7 million people will use the exchanges to obtain private health insurance for 2014, and that 6 million of them will qualify for tax credits. The poor performance of HealthCare.gov and ongoing issues in a few states could suppress enrollment, although the Obama administration maintains it will have the federal web portal functional by the end of the month, enabling people to sign up. Consumers have until Dec. 15 to choose a health plan that will be in place on Jan. 1, and the enrollment period ends March 31. HuffPost Readers: Did you receive a cancellation notice or a similar letter from your insurance company? Email us here and send us a copy of the letter you received. Include a phone number if you're willing to be interviewed. Let us know if you want to remain anonymous.